Educational leaders not only face moral and ethical decisions regarding their classrooms, schools, districts, and education institutions, but they also must consider the complexities and threats that impact their communities. In this unstable era of war, terrorism, natural disasters, accountability, and high stakes testing, this process is particularly daunting. 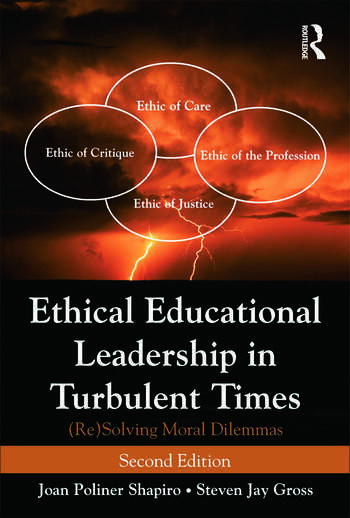 Ethical Educational Leadership in Turbulent Times is an engaging, case-study based text that will assist leaders in their ethical decision-making processes during a time of turbulence and uncertainty. The book is framed by Gross’s Turbulence Theory and Shapiro and Stefkovich’s Multiple Ethical Paradigms of justice, critique, care, and the profession. Presenting clear explanations of theory in combination with authentic dilemmas developed by practitioners, this book will assist leaders in dealing with challenging situations in their own settings. Expanded discussion of Turbulence Theory and addition of the most recent scholarship in the field of ethical leadership. New cases addressing adequate yearly progress, misuse of student data, financial pressures, curriculum design, student safety, athletics, and social justice issues. Updated end-of-case questions to reflect contemporary issues. Ethical Educational Leadership in Turbulent Times is a valuable book for both aspiring and practicing educational administrators and leaders. Joan Poliner Shapiro is Professor of Educational Leadership at the College of Education, Temple University, USA. Steven Jay Gross is Professor of Educational Leadership at the College of Education, Temple University, USA.